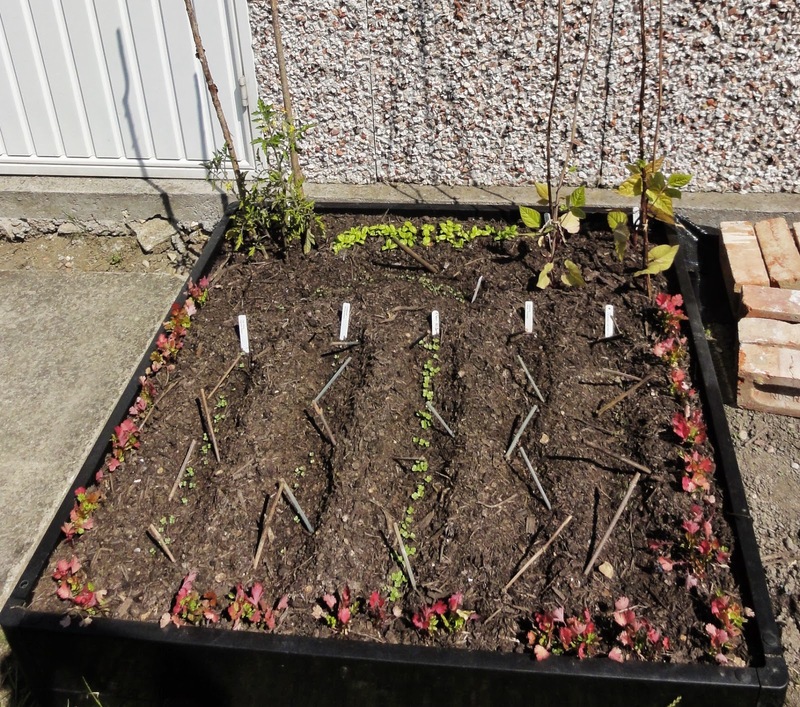 Along with recently setting up my first perennial beds, I have now also got my first vegetable raised bed growing. I did a soil test early on, and found out two key things. One: the soil is incredibly heavy clay. The kind of clay I'm guessing Whichford Pottery might be able to use for their pots! Incredibly heavy, red-like clay (perhaps iron in it?) that is hard to stick a stake into, let along for a poor plant to try and get it's roots into. Two: the soil is quite acidic in parts (some parts less than others). This is largely fine for most hardy perennials, most of which can tolerate a broader set of soil conditions (I did add a lot of compost to the perennial beds though, for nutrients and to improve the growing conditions). But acid soil is not much good for most vegetables as they need alkaline soil in which to grow. This information led me to decide to dig up the grass and top soil*, about a couple of inches, and to build on this with deeper raised beds than I have previously (30cms tall rather than 15cms). 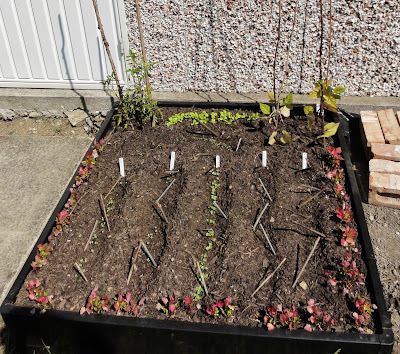 By creating deeper beds, it would extend what I can grow within them, including more deep rooting vegetables like carrots, parsnips and potatoes, as well as more shallow rooting vegetables like lettuce and spinach**. *You would normally keep your top soil, but as mine was just acidic heavy clay, compacted and weedy, it would have been almost useless to use for growing vegetables. Plus, a lot of work trying to separate weed from clay - just not worth the time/effort. 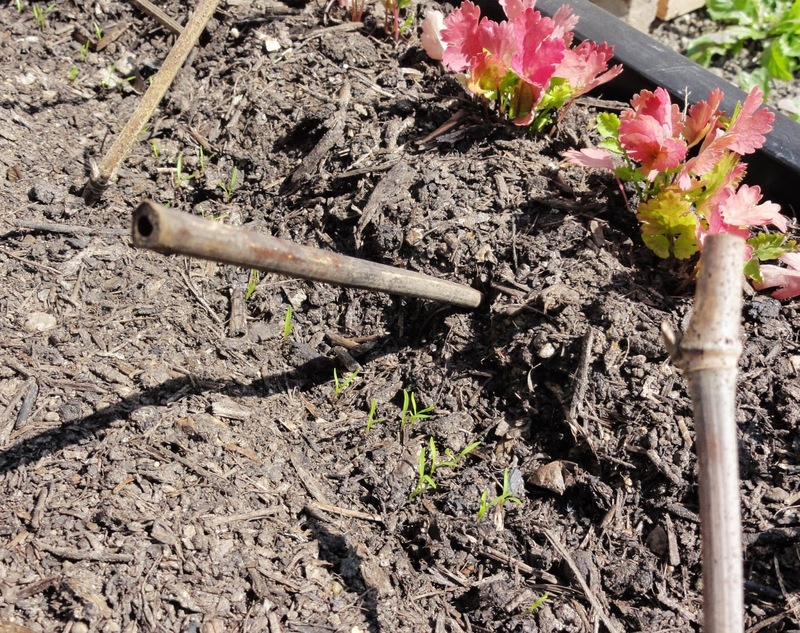 **Though spinach can send down some deep roots, I have discovered in the past when pulling out the old bolted crop at my previous lottie. 60cms or longer roots - impressive. 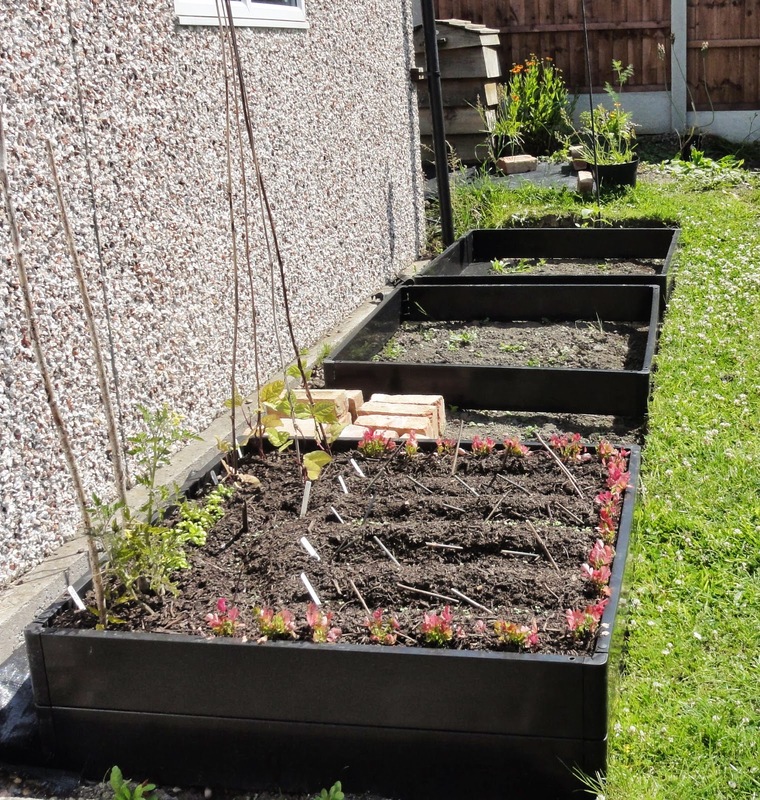 30cms deep raised bed, using a double row of link-a-bords. 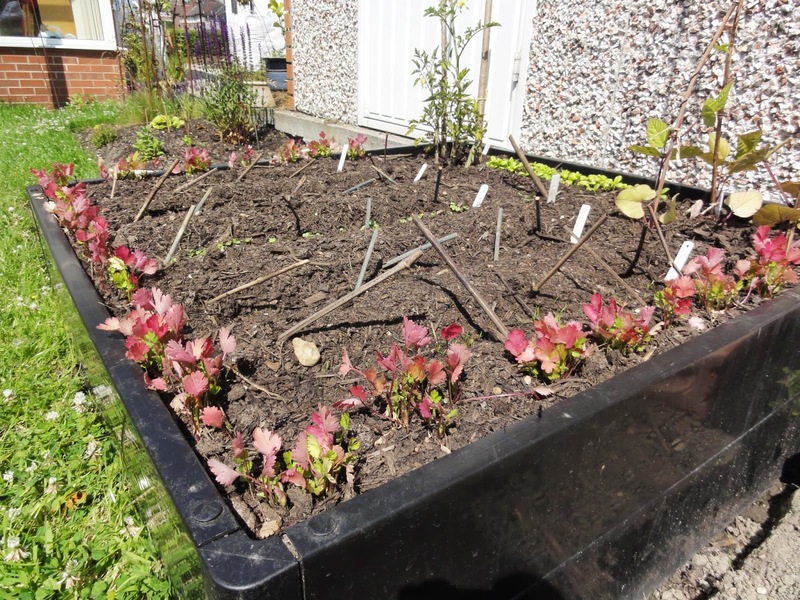 This first bed now contains a mix of vegetable seedlings, including carrots, pak choi and winter cabbage, along with tomato and climbing French bean plants, basil & coriander. I chose a shorter variety of carrot, D'Eysines from Real Seeds rather than a longer variety that might end up growing into the acid soil. I had a bunch of coriander seedlings I had grown in pots and decided to plant them out around the edge of the bed, particularly next to the carrots. I just thought this might help deter carrot fly. I've not read this anywhere, rather I just had a theory that coriander has a strong fragrance and that it might be worth trying as a deterrent for carrot fly. Let's see what happens. I have two more double raised beds to build over the coming few weeks. I want to get some more seeds sown, like kale, spinach and chard, so I have something to harvest in Winter and early Spring. I'm having to do this all a bit more slowly than I would like due to health issues (I have ME), but that's ok. I've finally got my first vegetables growing, despite moving into a new garden with acid soil only 3.5 months ago, and I'm pretty pleased with that. If you are interested in growing using raised beds, do read VP's latest blog: I heart raised beds. It gives a very good overview for other reasons (besides acid soil) that growing vegetables on raised beds is definitely worth a try.